Scotland's year of Homecoming will be an "extraordinary celebration", First Minister Alex Salmond said, as the first events officially got under way. A weekend of celebration is being held to mark the 250th anniversary of the birth of Robert Burns, and the start of the Homecoming programme. It aims to attract expatriates back to Scotland to celebrate the country's culture and heritage. The Burns weekend marks the start of the year-long programme of events. Traditional Burns Suppers will be held as far afield as Kazakhstan and Malawi, Moscow and Sydney, but the focal point of this weekend's Scottish festivities will be Alloway in Ayrshire, the village where Burns was born in 1759. Mr Salmond will attend the Homecoming Burns Supper there on Saturday night. And locations associated with the bard, such his birthplace cottage, Alloway Auld Kirk and the Brig O'Doon - which featured in his famous poem Tam o'Shanter - will be brought to life with recitals and performances. Interest in the event has been huge, with more than 3,000 people from the UK and around the world entering the ballot for 1,000 tickets. On Sunday, up to 10,000 people are expected to take to the streets of Dumfries - where the poet died in 1796 - for Burns Light, a lantern procession featuring children from 42 schools. 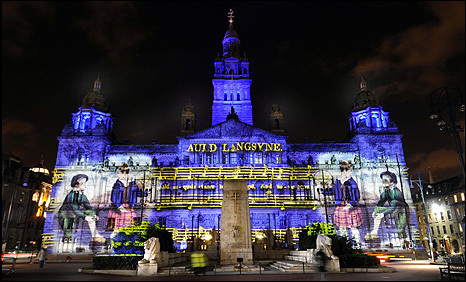 Across the weekend, Glasgow's City Chambers will be illuminated with the story of Robert Burns projected onto the building in a 15-minute light and sound show and the city will also host a Burns concert at the Royal Concert Halls. In Edinburgh, hundreds of people attended a Burns ceilidh at the Assembly Rooms on Friday and a Burns Supper will be held in Aberdeen on Saturday, although the official Burns Night is not until Sunday 25 January. The celebrations will also extend beyond Scotland's shores, with a Global Burns Supper event attracting more than 3,000 registrations on the Homecoming website. Mr Salmond said: "The big weekend has now arrived. "This is the start of an extraordinary celebration - a once in a 250-year celebration - of the lasting legacy of Robert Burns and the country that he loved. "We are inviting everyone, everywhere at home and abroad who has an affinity for Scotland and a pride in their Scottish heritage to come and join us this year. "This will be a party worthy of Burns himself." The first minister said that despite the "difficult and uncertain" economic outlook, the 300 Homecoming events were expected to generate £40m in additional tourism revenue as 100,000 visitors were due to come to Scotland over the course of the year. The programme is centred on five themes comprising whisky, golf, great Scottish minds and innovations, culture and heritage and Burns. Marie Christie, director of Homecoming Scotland, said she was "delighted" with the response to the weekend's events. "Homecoming is about creating a real sense of celebration in Scotland and inviting the world to share it with us," she said. "The fantastic community response is testament to the interest and enthusiasm for Burns and this unique celebration." To mark Burns' anniversary, the Royal Mint has produced a special commemorative coin and the Royal Mail unveiled a set of stamps showing a well-known portrait of the poet by Alexander Nasmyth. 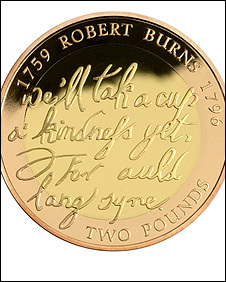 Do you have pictures - still or moving - of events celebrating Burns? Send them to the BBC news website. Click here to send an email.